Signal Transduction during Biomembrane Fusion begins with three review articles that put the problem of signal transduction and biomembrane fusion into a general perspective. Each subsequent chapter begins with an introduction which reviews past work on a specific biological system. The authors' current research is then detailed. The chapters conclude with final comments wherein the contributors express viewpoints about the general significance and progression of their work. 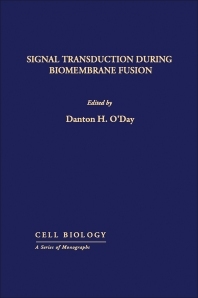 This book comprises 12 chapters, with the first focusing on signal transduction during biomembrane fusion. The succeeding chapters then discuss the ""focal membrane fusion"" model; osmotic phenomena in membrane fusion; cell signaling and regulation of exocytosis at fertilization of the egg; and signal transduction during exocytosis in mast cells. Other chapters cover protein kinase c and granule membrane fusion; GTP-binding proteins and formation of secretory vesicles; and signal transduction during phagocytosis. The remaining chapters discuss calcium signal transduction pathway and myoblast fusion; phospholipid metabolism during calcium-regulated myoblast fusion; protein kinase c, membrane protein phosphorylation, and calcium influx in chick embryo skeletal myoblast fusion; and signal transduction and cell fusion in dictyostelium. This book will be of interest to practitioners in the fields of neurobiology, zoology, and the biological sciences.